Discussions Magazine Music Blog: PEZBAND/COVER TO COVER (REMIXED) reviewed! 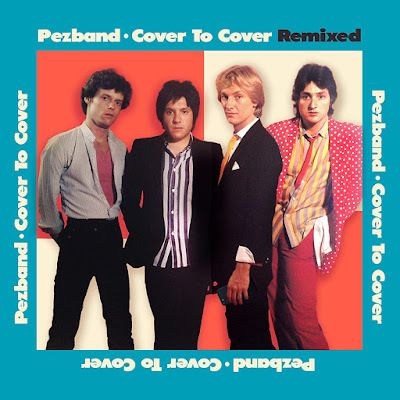 PEZBAND/COVER TO COVER (REMIXED) reviewed! Before social media, Power Pop was a genre that wasn’t always spoken about by the media but was certainly beloved by music fans. The ‘Power’ was created by guitars and the ‘Pop’ was nestled in the harmony-laden melodies. From Buddy Holly to The Beatles, The Raspberries to Shoes, Power Pop has always existed in some form during the Rock era but wasn’t given a proper classification until the late ‘70s. In fact, some folks have been listening to Power Pop for years without knowing that the bands in question were often classified as Power Pop (Badfinger, Squeeze, etc.). However, since the dawn of social media, Power Pop has been under attack by artists, the media, and fans of the genre itself. Instead of just enjoying the music, social media has opened up the floodgates and allowed trolls to change the direction of the conversation. Now, everyone is an expert and everyone else is wrong. Yes, even fans of the genre fight amongst themselves! A word to the wise guy: this isn’t politics, it’s Pop Music. Let’s set aside all of the infighting and focus on the music again. In fact, let’s turn the clocks back 40 years and rediscover a classic album that defines the term Power Pop. And when I say ‘rediscover,’ I mean that literally because Pezband’s 1979 album COVER TO COVER has been remixed and brought back to life thanks to Jem Records. If anyone wants to know what Power Pop was – and is – all about need to look no further than this classic slice of Rock ‘n’ Roll history. COVER TO COVER was the third album from the Oak Park, Illinois-based quartet. Originally released by Passport Records, the album followed up the band’s beloved first two albums (1977’s PEZBAND and 1978’s LAUGHING IN THE DARK) and was expected to be the album that would push them to the next level. Sadly, it ended up being their final full-length album and the band went on a decades-long hiatus a few years later. COVER TO COVER, despite its original tinny mix, was filled to the brim with wonderfully crafted melodic Pop songs that recalled beloved artists like The Beatles and especially The Raspberries. Working outside the restrictions of the major label machine, Pezband was able to create some of the most spirited melodic guitar Pop of the late ‘70s. The band personified all that is great about Power Pop: melodic Rock ‘n’ Roll with plenty of heart. There’s a reason that Pezband is now referred to as legends, trailblazers and icons. COVER TO COVER had a lot to do with solidifying their place in Power Pop history. Now, it is reborn with a dynamic new remix that takes the album to new heights. With more crunch, more sweat, and way more POWER, this is POP at its best! Songs like “Back In The Middle,” “Full Power,” “Stella Blue,” “Make Me Happy,” and “Meika” jump out of your speakers and pummel your senses… with love. Even with more thrust, “Didn’t We” sounds even more tender than ever before (not to mention the ‘acoustic’ version added as a bonus track, which sounds more Badfinger-esque than the regular version). While the initial release was pretty damn impressive, this remix adds a few extra layers of emotion and makes it pretty damn essential. This release reminds us that the band was/is just as vital as contemporaries like The Beat, 20/20, The Plimsouls, The Flashcubes, and Fools Face. It is time to rediscover the majesty of COVER TO COVER!